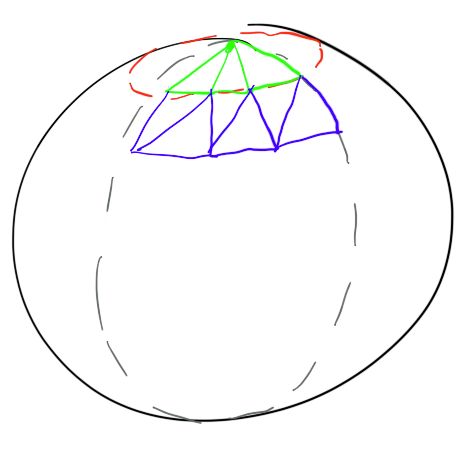 How do you programmatically generate a sphere? Could someone please explain how it would be possible to create a sphere vertices, indices and texture coordinates? There is a surprising lack of documentation on how to do so and it is something that I am interested in learning. I have tried the obvious, googling, looking on gamedev.net, etc. However, nothing covers the generations of spherical points, indexing them, and texturing. The leftmost is termed the uv-sphere and the rightmost an icosphere. GLUT tends to use the uv approach: look at the function glutSolidSphere() in the freeglut sourcecode. The uv-sphere looks like a globe. For many purposes it is perfectly fine, but for some use cases, e.g. if you want to deform the sphere, it is disadvantageous that the density of vertices is greater around the poles. Here the icosphere is better, its vertices are distributed evenly. You may also find this interesting: http://kiwi.atmos.colostate.edu/BUGS/geodesic/text.html it describes an approach to organising the faces into zones. http://vterrain.org/Textures/spherical.html gives an excellent description of how you might choose to texture them. Create an icosahedron and recursively subdivide faces until desired tessellation reached. For the first way, you just use a double nested for to walk theta and phi. As you walk theta and phi, you spin triangles to create your sphere. So note above, its important to wind the top cap and bottom cap using only tris, not quads. You then have to just look at a diagram of an icosahedron and wind faces from those verts. I already have code that does it here. In the simplest case, you can then uniformly pick points at random by picking two uniformly distributed variables u and v from (0, 1) and calculating the polar coordinates from them according to the formulas θ = 2 × π × u and ϕ = arc cos (2 × v - 1); then dismissing any points which lie too near to the already picked points. For a slightly more complex and significantly better-performing algorithm, see "Dart Throwing on Surfaces" by Cline, Jeschke, White, Razdan and Wonka. After you picked your first four points (assuming no three of them are degenerate, that is - they don't lie on the same great circle, but that's highly unlikely), you can create four faces between them, and each time you add a new point, you can split the face it belongs to accordingly into three sub-faces. For texturing purposes you can then map the points to a cube map. Not the answer you're looking for? Browse other questions tagged rendering geometry procedural-generation or ask your own question. where have the shape drawing functions gone in DirectX10? How do you turn a cube into a sphere? How to generate a city street network? How would you generate details like trees, water or caves in a 2D terrain? How do I generate a sphere mesh in Unity?